Some online slots take their influence from certain periods of time and here we have one more which does just that; The Buzz Slots is a game developed by OpenBet set firmly in the UK in the late 1970s and focused on the counterculture music at that time – find out how it all works right here. 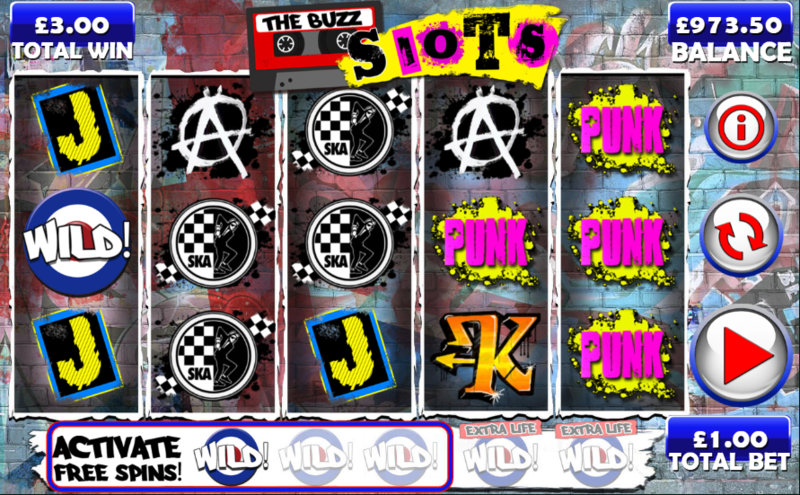 The Buzz Slots is a five reeler with three rows and twenty fixed paylines; the anarchy of punk and the attitude of Ska and Mod music lend themselves to the design of this game with the reels set against the English flag covered in graffiti and soundtrack appropriate to the theme. 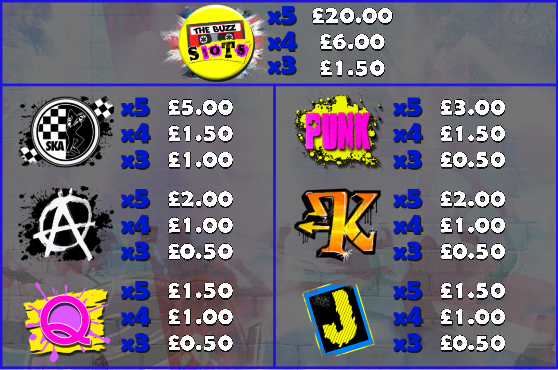 The higher value symbols include The Buzz Slots cassette, the Ska icon, the pink ‘Punk’ and the anarchy sign; J, Q and K are the lower values. The ‘Mod’ target is wild and it will substitute for all others to help form winning combinations except for the ‘Show Cancelled’ symbol (which only appears during the free spins anyway). Each time you land a win, those symbols involved will freeze in place and you’ll get a respin – any more matching symbols will also freeze and award a further spin. When no more matching symbols land the payout will be evaluated. After any winning spin the screen will turn into a record deck which spins until the stylus stops on a multiplier of up to 10x. This is triggered by landing three or more of the wild symbols anywhere in view (helpfully displayed below the reels); the number of spins is unlimited but each time a Show Cancelled symbol appears on reel five you’ll lose a life. Three, four or five triggering symbols will award three, four or five lives initially. We like the attitude of The Buzz Slots and the era of rebellion to which it harks back; it’s pretty good as a slot too with various interesting bonus features, some good looks and an RTP of 95.49%. Good stuff!